If you’ve ever tried to coordinate your curtains to your wallpaper, or your carpet to your sofa, you’ll know the painstaking angst of colour matching. Do I harmonise or contrast? Emphasise or play down? It’s a process. We hear you. We’re often asked to coordinate our self-playing pianos to match an interior design. Sometimes the `brief is straight forward – match this lampshade or that fabric, this dress or that car. (Yes, really). Last week, for instance, we hand-crafted a baby grand piano to complement the walls of a stylish penthouse apartment. Think lustrous crimson, somewhere between fifties pin-up lipstick, a ripe tomato, and a dahlia in full bloom. A real show stopper. But sometimes, our customers have a mood in mind, but no fixed idea of colour or finish. Which means we need to keep up-to-date with the world of interiors, so we can craft creative personalised pianos as on-trend as they are imaginative. So, last month we consulted with some of the world’s most influential interior designers and scrutinised the social media accounts of 40 million interiors fanatics (OK, we let design platform Houzz do all that really) to find out what this year’s interior design trends are. 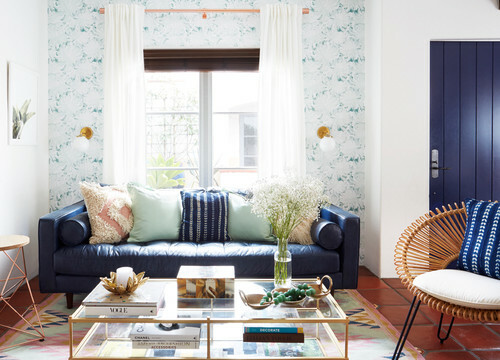 Here are three exciting snapshots from Houzz’s home-design-trend predictions for 2018. While we can’t promise you a concrete piano just yet, we’re going to be seeing more a lot more of these trends in our homes and Instagram feeds over the coming months. Industrial chic just got personal. 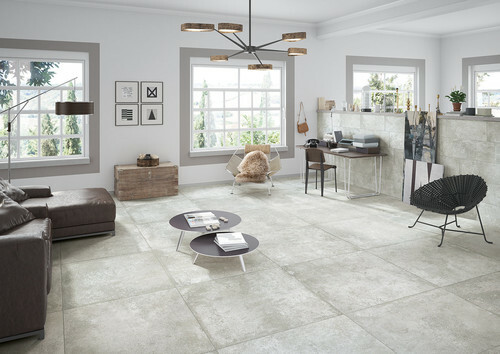 If concrete stairs, flooring or kitchen worktops don’t give you goose bumps of pleasure, how about concrete-look wallcoverings, or bespoke concrete furniture? From polished concrete lampshades and minimalist wall lights, to chairs, coffee tables and bookcases combined with glass, metal and wood—you can now create almost any shape and form using this humble material. What better than the cool, muted greys and raw beauty of concrete to highlight that jewel-coloured sofa (or piano) you’ve been eyeing on Pinterest? If you’re suffering from snow blindness thanks to your white bathroom and white kitchen—how about a matte black finish? While black is the classic, go-to to colour for self-playing pianos, for the home, it’s contemporary, off-beat, arresting and versatile (not to mention durable). Start by trying some inky hardware: taps, lampshades, handles, light fittings and radiators. And, if you’re feeling super daring, you could explore the world’s darkest man-made substance, Vantablack. So black, in fact, it changes the dimensionality of an object and tricks the eye into thinking anything painted with it is completely flat. Once upon a time, mixing metals, was a bit of a no go. Bit jarring. Bit gauche. But rules are there are to be broken and we’re fully embracing the trend for swirling metals, textures and sheens together. Like a shiny brass splashback with earthy copper countertops. Or silver picture frames with gold-trimmed lampshades. It’s time to add some mashed up metallic to your home. If juxtaposing metals makes you nervous, however, stick to using similar tones together—chrome and steel for a cool contemporary look, rose gold and vintage brass for a warmer glow. All of which lead us nicely to Houzz’s colour predictions for the year—warm greys (thank you concrete) and rich, earthy shades of tobacco, dark woods, camel, rust and brown-blacks. They sound rather lovely on a custom-made piano, don’t you think? How about you? Are you ready for concrete and matte black interiors yet?